Rediscover an ancient trail, called the "Salkantay Route”, that ends in the legendary ruins of Machu Picchu. Challenge yourself as you hike through nine different bio-zones, whilst indulging in the comfort of enchanting mountain lodges with innovative gourmet cuisine. Day 6: First Views of Machu Picchu from Llactapata Pass. Stopover in the cultural Cusco and stay at some of the beautiful boutique hotels we have to offer. Ask us about our 3 night Pre and Post Cusco Package which includes a comprehensive Cusco City Tour and more. Choose from our range of deluxe to luxury cruises to the Galapagos Islands. Add in a 3 or 4 day trip to an Amazon lodge or upgrade to an Amazon luxury cruise. Tonight you will meet your guides and other travelers for an important but informal meeting held at El Mercado Hotel in Cuso at approx 6pm. The meeting will run for approximately 45 minutes. If you would like to stay for dinner we recommend La Taberna Restaurant at El Mercado Hotel, which offers Peruvian and International cuisine in a cozy, yet elegant setting. Accommodation and meals not included on this day. After an early breakfast, we are picked up starting at 7:00 am at your Cusco hotel by a MLP guide and vehicle. En route we take a short break to visit the Archeological site of Tarawasi near the town of Limatambo (approx. 1.5 hrs from Cusco). 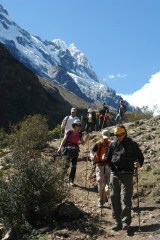 Salkantay Lodge takes its name from the majestic peak at the head of the valley - Mt. Salkantay, the second most sacred peak in Inca mythology and, at 6,270 m (20,600 ft), the highest in the region. After a warm welcome by our friendly staff, we are shown to our rooms and have time to freshen-up, before tea and cookies. The trip leader will hold a briefing by the fireplace, followed by aperitifs and dinner. Overnight at Salkantay Lodge at 3,869 m/12,690 ft. This is the big day! After an early start, we hike up the Rio Blanco valley, circling Humantay Peak across from Salkantay Peak. The highest point on the trek is the Salkantay Pass at 4,638 m (15,213 ft). At the pass we stop to take in views of snowcapped peaks of the Vilcabamba Range in every direction, the glaciated south face of Salkantay towering above us. We will keep our eyes out for Andean condors, often visible in this area. From the pass we descend towards Wayra Lodge (“Wayra”: wind; from the name of the location “Wayracmachay”: ‘the cave where the wind lives’) our destination for the evening.A hot lunch is served en route; dinner and overnight at the Lodge. Upon arrival at Colpa Lodge we are greeted with a Pachamanca, a traditional festive Peruvian meal cooked by layering meat and vegetables with hot stones. Everything is then covered with hot stones, plantain leaves, high Andean grass and local herbs and the contents are baked in this underground oven. Colpa Lodge is located on an open plateau at the confluence of three rivers. The outdoor jacuzzi has panoramic views of lush green mountains. We spend the afternoon relaxing or exploring the nearby orchid trail. Dinner and overnight at the lodge. Overnight at Colpa Lodge at 2,870 m/9,414 ft.
Today we hike along the Santa Teresa river valley, through more populated rural areas. We pass through banana, granadilla, and avocado orchards and coffee plantations (said to be one of the best organic coffees in the world). A hot picnic lunch is served by the river. After lunch, we hike another hour before a private vehicle meets us for a short drive to the beginning of the “Llactapata Inca Trail” (aprox. 30 minutes). From the head of the newly restored Inca trail we easily make our way to Lucma Lodge, set in an avocado orchard. On the way we visit an organic coffee plantation where we join the owner on a short tour of the farm and learn how coffee is grown, harvested, dried and processed. Dinner and overnight at the lodge. Overnight at Lucma Lodge at 2,135 m/7,003 ft.
We take a short break to explore the Archeological site of Llactapata, which have recently been restored. Lunch is served at a scenic viewpoint, looking out to Machu Picchu. After which we begin our final descent to the Aobamba River through lush bamboo forests, orchards and coffee plantations. We then board a train for a scenic ride (approx. 1 hour) to Aguas Calientes, the town of Machu Picchu. Upon arrival, we check into an award-wining hotel for a celebration dinner with our guide and one last briefing! Overnight in Aguas Calientes at 1,900 m/6,232 ft.
After a very early buffet breakfast at the hotel, we make our way to the bus station for the ride up to Machu Picchu Sanctuary (30 min). Our trip leader will give an introductory 2 hour guided tour of the ruins, after which we have the option of climbing the steep staircase of Huayna Picchu, a steep and vertically quite challenging hike that takes about 2 hours which affords great views of Machu Picchu. Afterwards, we meet up with our guide again and return by bus to Aguas Calientes for a late lunch and to catch our train back. The ride from Aguas Calientes to Ollantaytambo takes about 1½ hours, and then a private vehicle will drive us back to Cusco (an additional 1½ hour). Upon arrival in Cusco (approximately 7 or 8 p.m.), we are dropped off at your hotel. Return to Cusco at 3,360 m/11,021 ft. Located at 12,795 feet, Salkantay Lodge takes its name from the sacred most sacred peak in Inca mythology, which stands tall at a spectacular 20,500 feet. The Lodge features 12 rooms, 1 hot tub, reading room, Trout fishing, horseback riding and fantastic views of an enormous glacier-cloaked mountain, this luxurious weigh station is on a lesser known route to Machu Picchu Located between Humantay Peak and Salkantay Peak, it sits in Peru’s Soraypampa Valley, on an unspoiled landscape of towering peaks and alpine grasslands. Perched on a 1,000 foot bluff above the river, the Colpa Lodge rests in a cloud forest at 10, 3000 feet overlooking the Colpampa Valley, near hot springs and confluence of three rivers; where you can hear the union of the three rivers. Lucma Lodge is built right into the mountainside and flanked by an avocado orc hard. Near the village of Lucmabamba, it is in a tropical rainforest of an archaeological reserve, at the head of the Inca Trail. Lucma lodge is also fully equipped and serviced. There are 6 private double rooms, each with a private bathroom complete with hot and cold water. There is also a cosy reading room, fireplace, central heating and a relaxing outdoor Jacuzzi to bubble away any aches from your day out trekking. Decorated with Andean tapestries, this hotel is supremely serene and cosy, yet full of breathtaking wonder. Inkaterra Pueblo Machu Picchu is located in Aguas Coliente and is just a short distance from the bustling pedestrian-only town of Machu Picchu Pueblo (Aguas Calientes). This is a sanctuary in every sense. The vibrant culture of the Andes is ever-present here, in the architecture, the tasteful carvings and textiles, the delicious cuisine, and the mystical vestiges of the Inca. There is a restaurant that that offers Andean cuisine overlooking the Vilcanota River and all rooms offer private bathroom with free wifi. We recommend that our guests spend at least two nights in Cusco prior to departure. This helps with acclimating to the altitude and also provides an opportunity to explore the beautiful city of Cusco. Everyone’s tolerance to altitude differs and we encourage our guests to make exercise and a healthy diet a part of their training program before their trip. We encourage our guests to prepare by exercising regularly and having a healthy, balanced diet prior to the trip.